Pants- The rider should wear pants which are long enough to cover the ankle when seated. Jeans are fine, but riding pants are even better. Riding pants made from stretchy material make it easier for the rider to bend their legs. Riding pants also have a leg patch on the inner calf to prevent wear on the inner seam and to provide better grip. Riding pants are also made so as not to “ride up” which is a common problem when wearing jeans for riding. Jodhpurs, breeches, or tights (types of riding pants) will keep the rider comfortable and assist in their riding success. Please do not wear any pants that have rivets, studs, rhinestones or anything which will scratch the saddle. Low-rise jeans are not recommended, unless you want to show a plumber’s crack! 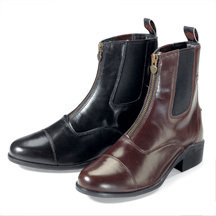 Boots – Boots which cover the ankle and have at least a ½ inch heel are required. 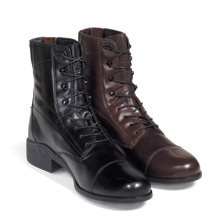 Paddock boots which either lace or zip up are preferred. 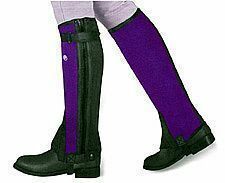 Safety requirements are for a heeled boot in order to keep the riders foot from slipping completely through the stirrup. Tennis Shoes, hiking boots or boots which have a thick tread are not allowed. Helmet – Helmets are required to be worn by all riders while mounted. 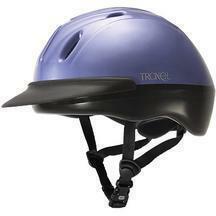 Helmets must be an ASTM/SEI approved horseback riding helmet with safety harness. Helmets are provided for riders, however some riders prefer to purchase their own helmet. If purchasing your own helmet, please make sure it is an approved helmet with safety harness and that it is properly fitted. Shirt – Close-fitting shirts/tops that cover the shoulders need to be worn for riding. Loose clothing may catch on equipment. Half Chaps – Half chaps are not required, but they are helpful in protecting the riders leg and providing better grip. Half chaps protect and cover the riders lower leg and ankle and help the rider grip with the knee and lower leg. They “bridge the gap” between breeches and boots. Half chaps are usually made of leather, suede leather, or synthetic leather. The zip-up type wear the best. Gloves – Riding gloves are not required, but can be worn to protect the hands and provide better grip. Gloves made of leather or synthetic leather work the best. Knit or fleece gloves can be very slippery and make it difficult for the rider to hold the reins. Cold Weather – Layering works best in cold weather. Layer clothing which is thin under an insulating layer, with an outer layer that is windproof. Coveralls are also excellent in cold weather. Hot Hands and Toasty Toes are also recommended for extremely cold weather. They are air-activated and can be inserted into gloves and boots for added warmth. Knit hats cannot be worn under the helmets, but an ear band worn with the helmet works very well to keep the ears warm.